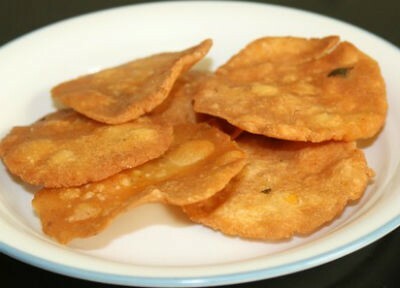 Thattai is a crispy, deep fried snack popular in South India especially in Tamil Nadu. Prepared using rice flour, they are a great any time snack. 1. Soak the moong dal in water for a few hours and drain the water. 2. Combine rice flour, white sesame seeds, moong dal, roasted gram flou, peppercorns, salt and enough water. 3. Mix well to a thick dough. 4. Make small balls and roll them into a flat thattais. 6. Fry the prepared thattais till light golden brown. Feel free to comment or share your thoughts on this Pepper (Milagu) Thattai Recipe from Awesome Cuisine.